We are four friendly churches serving the Parish of The Whitacres, Lea Marston and Shustoke. We strive to continually discover ways in which we can offer God's love to everyone in the parish. Our services are quite relaxed and of a central tradition. We have a mix of Holy Communion and Morning Prayer services, please do have a look at our service pattern to see which services might suit you best. Everyone is made welcome here, whether it is your first time in church or you have been coming for a lifetime. We hope you enjoy looking round our website. We'd love you to come and visit us soon! 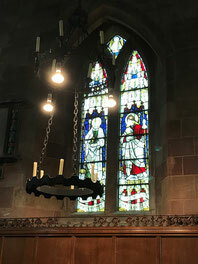 We are a parish of four churches in rural North Warwickshire, part of the Church of England in Birmingham. Click on the photo above to learn more about each of our churches. Weddings are an exciting part of church life. All the information you need is right here. Please click on the image above. Since we are a parish of 4 churches we rotate our servicees around the churches during each month. Information of our weekly and special services can be found by clicking on the image above.